The modern era of Leibniz scholarship was inaugurated by two groundbreaking books published in the first years of the twentieth century. The first to appear, in 1900, was Bertrand Russell's A Critical Exposition of the Philosophy of Leibniz. A year later there followed Louis Couturat's La Logique de Leibniz. Since their publication these two works have been seen as embodying a common interpretative approach that stresses the fundamental importance of logic for Leibniz's philosophy. Although their accounts differ, Russell and Couturat both give prominence to Leibniz's explanation of the principle of sufficient reason in terms of a more basic notion of propositional truth, articulated in the principle that in every true proposition, necessary or contingent, the concept of the predicate is contained in the concept of the subject. From this theory of truth, they argue, follow the most distinctive claims of Leibniz's metaphysics, including the principle of the identity of indiscernibles, the complete concept theory of substance, and the theory of preestablished harmony. Scholars have raised a variety of objections to the Russell-Couturat interpretation, yet none deny that their books remain significant contributions to the understanding of Leibniz's philosophy. 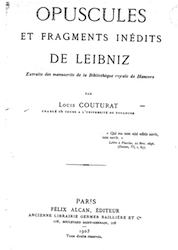 Tim Monroe and I set out to translate La Logique de Leibniz because we believed that, in the English-speaking world, Couturat's contributions had not been sufficiently appreciated. Although Russell's Critical Exposition offers a more rigorous analysis of Leibniz's metaphysics, Couturat's book remains unsurpassed as a survey of the full range of Leibniz's work in logic and the philosophy of logic, the philosophy of language, and the philosophy of mathematics. 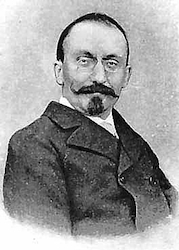 Couturat's success in this regard was the result of archival research that brought to light a wealth of unpublished writings on these topics that had been omitted from previous editions of Leibniz's works. 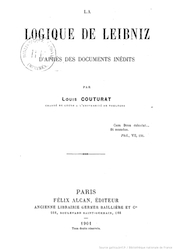 These texts were published by Couturat in the collection Opuscules et fragments inédites de Leibniz (Paris, 1903), which serves as a companion to La Logique de Leibniz. What follows are those parts of our translation that have been prepared for the web. As time permits, more will be added.